Found this one on the Coffee Spoons blog. 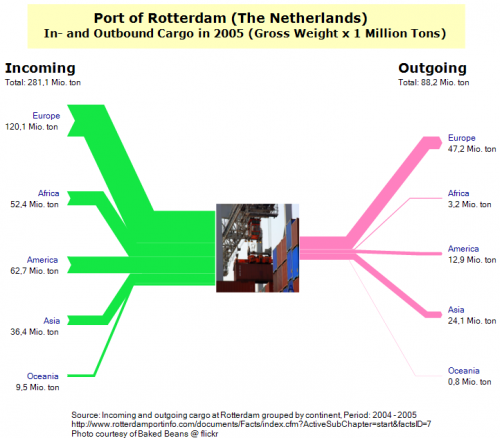 It is originally from an infographic created by Sergio Peçanha of the NY Times. 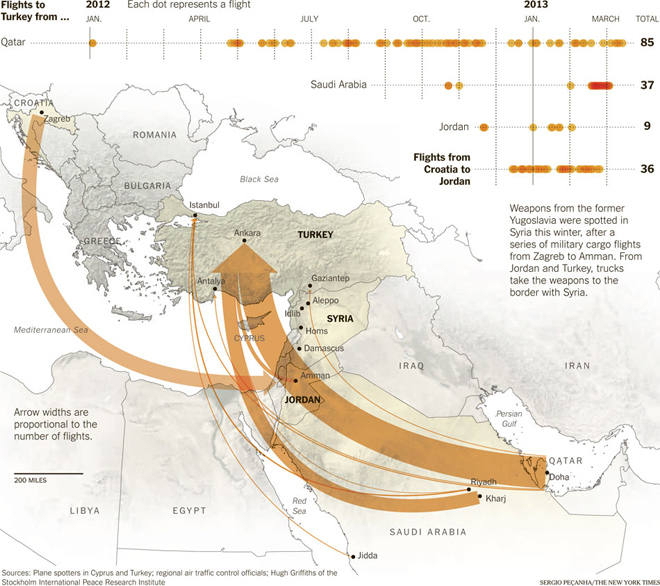 The Sankey diagram shows cargo flights supposedly loaded with arms, from Doha and Riyadh (among others) to Turkey, and from Zagreb to Amman. All supposedly destined for onward transport to Syria. The “arrow widhts are proportional to the number of flights”. An additional 2012/2013 time line shows the flight dates and their density. Interesting. One mustn’t confuse the Sankey arrows with number of arms being transported, as there might have been different planes and consequently different cargo loads. Now I think I should also be looking for a “civil” version, with pax being transported on commercial airline flights. Last weekend I had the possibility to visit a friend in the Netherlands, and we took a tour of Rotterdam Port. Despite the bad weather, I was fascinated by the huge container ships, the cranes, the noises…. Back home I did some research and came up with the cargo data for the year 2005 from the Port of Rotterdam website. I did the following three Sankey diagrams. 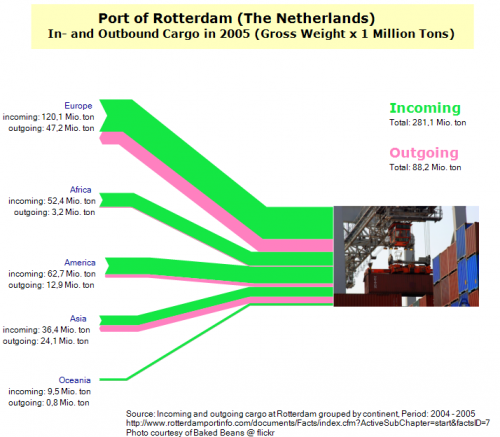 The first shows the inbound cargo quantities (in million tons gross weight of cargo) from the left, and the outbound quantities to the right, broken down to world regions. 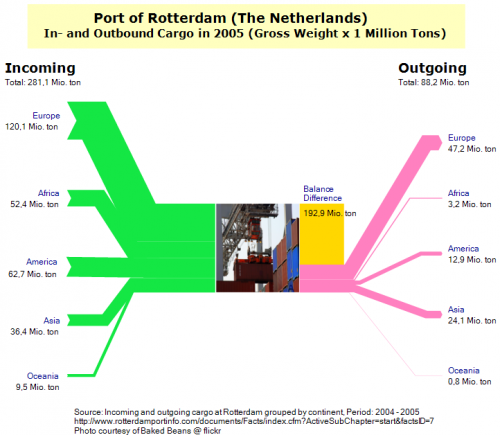 One can clearly see that Rotterdam handles mainly imports, with more than 281 million tons of cargo being unloaded, while only 88,2 million tons of cargo are being loaded onto ships. Next I flipped inbound and outbound flows to the same side. However, I think that by this the diagram loses somehow, also because some purple flows (outbound to Africa and Oceania) are too thin. In the third version, I added a shape for the balance difference between inbound and outgoing goods.